The Cumberland & Dumfriesshire Farmers Mart P.L.C. had forward at their Grand Opening Sale an entry of 709 Breeding Ewes and 1,406 Store Lambs, at Longtown on Tuesday 27th July 2010. A large audience of people were here to witness the first sale of the season, with trade superb. Breeding ewes were overall better quality with trade dearer. Top of £138 and £125 for Texel shearlings from Maxton House; Greyface £98 Knowe Head and Bayles. 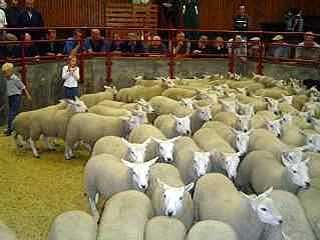 Ewes to £106 and £105 for Texels from Greenknowe; Beltex £90 Greenknowe; Greyface £79 Linton House; Lleyn £77 The Mark. Cast ewes to £78 Low Blaithwaite.